Our Earth is surrounded by layers of gases. This layer of gases is called atmosphere. It helps us to breath oxygen, fly the airplanes, and enjoy the breeze of air. Atmosphere extends up to 500 km in space from the ground. But, as we move up in the atmosphere its density and pressure will gradually decrease and temperature also changes. We can’t go up in the atmosphere without any pressurized suit. Because, after few kilometers pressure decrease to a value where we can’t survive. Troposphere: It is the densest layer of the atmosphere which has the 80% mass of the atmosphere. All the weather phenomena (storms, rains, and lightning) happen mostly in this layer. Also, the Airplanes fly in this layer. The troposphere extends up to 10 Kilometers from the ground, and we all live in this layer of the atmosphere. 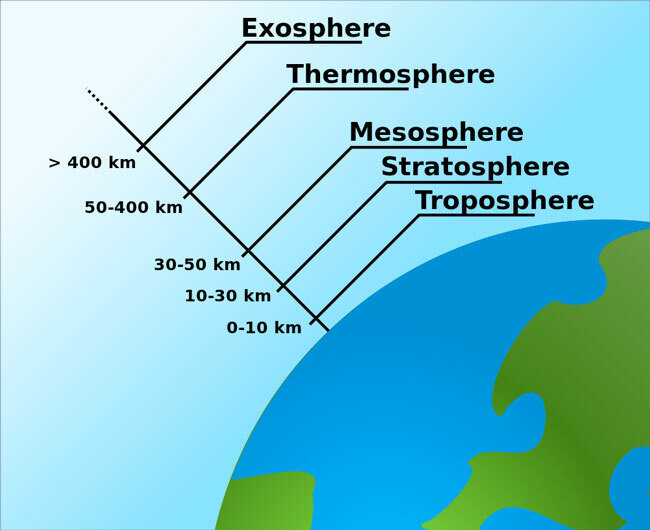 Stratosphere: The Stratosphere extends up to 50 Kilometers. This layer carries most of the ozone gas, which protects us from UV rays of the Sun. Whether balloons can fly up to this layer for measurement of whether parameters. Mesosphere: It extends about 50 kilometers further. This is the layer where meteorites mostly burn up when they enter our atmosphere. Mesosphere has the coldest temperature among all the layers of the atmosphere. Thermosphere: It has the highest temperature of all the layers. The temperature can reach to 1500 C or 2700 F. But, this layer is so thin that it won’t be able to burn your skin. Exosphere: After the thermosphere, the exosphere starts. It is the thinnest layer among all the layers. This layer extends up to 10,000 Kilometers into This layer is mostly composed of hydrogen and helium. So, what do you think where space begins? Actually, the atmosphere is so diffused in the space that there is no any clear boundary between the atmosphere and space. But space is officially considered 50 to 80 miles from the ground. Atmosphere covers our Earth like a blanket and insulates it from the space. It provides precious pressure on the ground so that we can live comfortably. Our atmosphere absorbs the heat from the Sun during the day and retains it for the night. As a result, our nights don’t get too cold. The stratosphere in the atmosphere carries the ozone gas. This gas protects living things on from cancer-causing Ultraviolet rays from the Sun. Our atmosphere also absorbs the deadly radiations coming from the outer space. But, we as a human don’t respect the atmosphere very well. Humans have been polluting the atmosphere from centuries ago. See Air Pollution for further information. The atmosphere contains greenhouse gases which absorb solar radiation and heat our Earth during the night. The atmosphere looks very thin if you compare it with the diameter of the Earth. Ozone gas molecule is made of three oxygen atoms bonded together, instead of 2 oxygen atoms that we breathe on the ground. Abdul Wahab, "Atmosphere," in Science4Fun, April 13, 2019, http://science4fun.info/atmosphere/.